Basketball has been part of my life since about the time I could walk. As a kid, I watched my cousin Keith Nies and the Cathedral Prep Ramblers compete in three state championships, including the 1996 showdown with Lower Merion and Kobe Bryant. I had dreams of following in his footsteps, lacing up my sneakers for the orange and black, earning a Division I scholarship, and playing in the NBA. I never realized any of those dreams. After playing freshmen and junior varsity basketball for Prep, I was cut from the varsity team as a junior, steering my basketball career into another direction playing in the local CYO league for my home parish of St. Jude. Although my basketball career fell a few steps short of a Hall of Fame enshrinement, I’ve had more than my fair share of shining moments. They may not have been ESPN or even Erie Times-News headline worthy, but they stand out in my memory just the same. To this day, basketball is entangled in my identity—player, coach, fan, student of the game. My relationship with the game changes and evolves depending on my role in it, but I cannot imagine my life without basketball being a part of it. 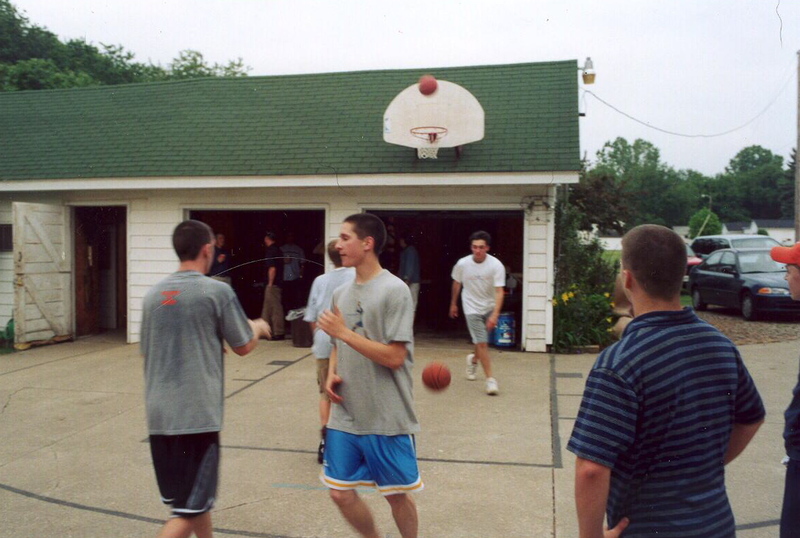 As I approach age 30, it’s pretty clear that my best basketball-playing days are behind me. Still, I plan to continue to find opportunities to play as long as my body will still allow it. Whether it’s a game of H-O-R-S-E or P-I-G at a family bonfire or a student-faculty game at Prep, if there’s a court calling my name, I’m going to answer. In my life, I’ve had the pleasure of playing basketball in a variety of different places and in different contexts. Click to read the full list counting down the top 30 places I’ve played. This one is unique. Pool basketball is its own animal, but we had some terrific summertime battles in the pool on Dutch Road. No team dominated my Our Lady’s Christian (OLC) Raiders squads in 5th-8th grade quite like St. John’s. The main reasons? They were bigger, faster, and better than we were. The secondary reason? Their court. The court was so narrow that the corner 3-point line was out of bounds. It was an added weapon for their full court press, and it caused me more turnovers than I’d like to admit to. On the positive side, the 6th and 7th grade tournament I played in there was a huge confidence booster for me heading into my 7th grade season, proving I could hang with the would-be 8th graders and earning me valuable minutes the following season. A hoop was one of the first investments I made after buying a house last year. Making a single jump shot at Scott Park always felt like such an accomplishment. The rims are so thick. Located across the street from OLC, we occasionally had recess here. For me, it was a major upgrade from asphalt football or, worse yet, foursquare. 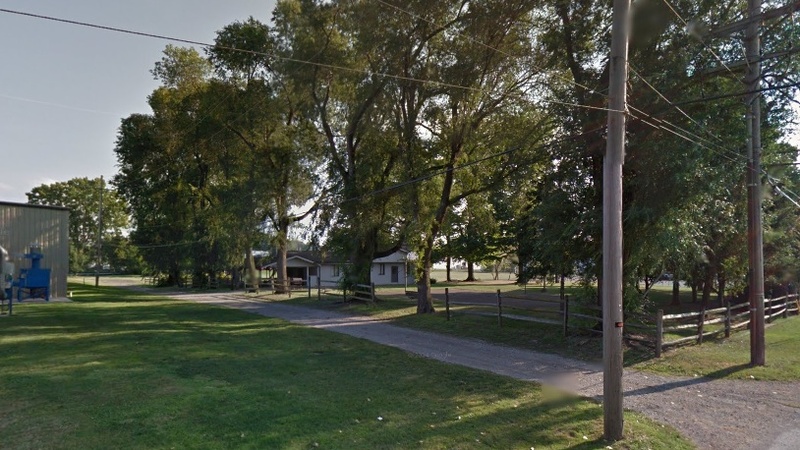 Located in Lawrence Park, I spent limited time here as a child. We would sometimes walk there when visiting my aunt Julie’s house. Bonus points for the fact that my wife grew up down the street. Who knew that years later I would drive by this park on a regular basis picking her up and dropping her off on date nights? Higher quality than Scott or Lake Cliff. I specifically remember playing in a summer league here when I was in high school. I played here in grade school, but the court scores bonus points for being my first home court as a coach. 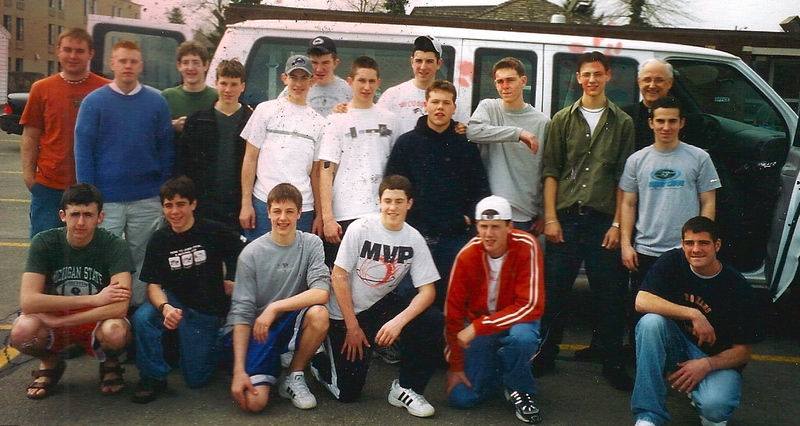 I was an assistant coach for Villa’s boys team during the 2006-07 season. My best memory here came in the summer after 5th grade when I played for a traveling all-star team called the Dunkin’ Dutchmen. We won the local tournament and earned a memorable spot in the regionals (see #2 on this list). A few reasons for this inclusion. For starters, I very nearly chose to attend Mercyhurst Prep. Their coach at the time, Pat Flaherty had coached me back when I was with the Dunkin’ Dutchmen, and he showed interest in me going there. 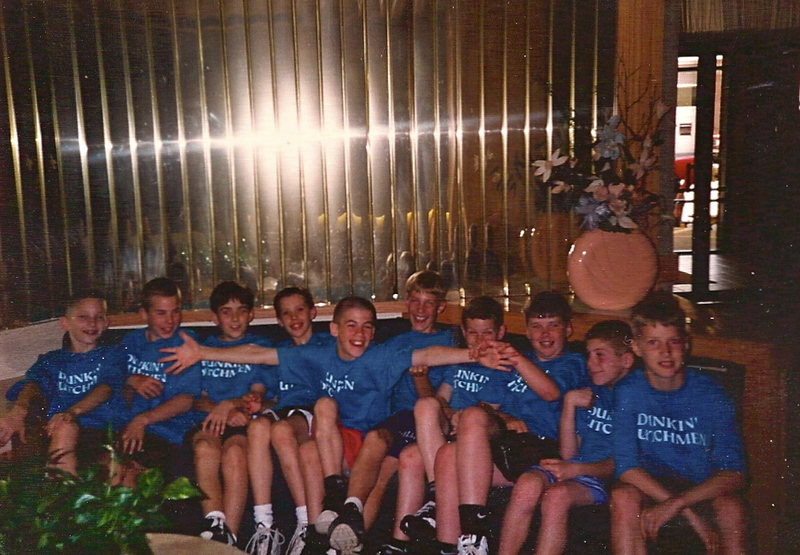 Secondly, my OLC competed in a tournament or two at Mercyhurst Prep while I was in grade school. It was a big deal back then to play on the big high school court. One of my favorite aspects of belonging to LECOM is access to the gym. This is a great facility. Unfortunately, my playing experience here was limited to my worst league experience ever. I played there in 2013 on the house team (AKA a collection of solo signups who didn’t know each other or have anyone else to play with). Our team was not good, but the kicker was that one of our players was every stereotype of the worst pickup basketball player. Ballhog? Check. Airmailing absurd no-look passes? Check. Finger-pointing at everyone but himself for mistakes? Check. Cherry-picking on offense/reaching and fouling on defense? Check. And-1 mixtape wardrobe? You already know the answer. These tweets tell the story of how frustrating it was to have this person as a teammate and also the reason why I was only moderately disappointed when an ankle injury prevented me from rejoining the league this past winter. I stumbled upon this gem years ago. Someone was putting together a panorama of the rec center while we were playing. The weird playing surface at OLP might have been enough to crack the countdown. Bonus points for being the home court of the CYO team I was an assistant coach for this past season. One of my favorite memories here was the “annual” tradition of the Nies family Turkey-ball game on Thanksgiving morning that only happened once. The adults quickly realized that full court basketball was not very forgiving on old muscles and joints. Bonus points for being the home court where I had my first head coaching gig, leading the Fairview freshmen team during the 2011-12 season. A half court shot at St. Pete’s is basically a regular 3-point shot. The length of their court is so short that the over-and-back violation had special rules on this court. This was an ancillary court for Marcel Arribi’s legendary Rambler Roundball Camp, where I spent time each summer in elementary school chasing my dream of becoming a Rambler baller myself. In some ways, B.S. is where my organized basketball career came to a close. I can still vividly recall the final moments. Trailing the Bulldogs in the final seconds, I drove and dished to an open teammate for a would-be game-winning 3-point attempt rather than forcing the shot myself. The shot was on line but missed. They secured the rebound and won the city tournament championship, ending my senior CYO season and my hopes of returning to the state tournament. Family driveway basketball is always a blast. Because the driveway courts are all of nonstandard dimensions, each location has its own quirks. Everything was pretty much straight-on on the Lutton court with a fence on one sideline and a slope on the other side. Almost opposite of the Lutton court, the Washek court had deep corners but a short distance straight from the basket. Primarily used for games of H-O-R-S-E, the Kleinhanz court is very long but not very wide. I’ve always shot very well on this hoop. It’s a simple rectangle of concrete. Just don’t miss badly to the right or you’ll have to hop the fence! As the home court of Prep’s varsity games and the McDonalds Classic/Burger King Classic, the Hammermil Center was held in high regard. Although I only played a limited number of games here during my sophomore season on Prep’s JV team, its place in Erie basketball earns it this spot on the countdown. This photo is taken from Google Maps street view. You can see the court there behind the trees to the right of the driveway. I don’t really know how else to identify this place. It’s located on West 23rd Street across the street from Rabe Environmental Systems. All I know is that I played and won more games of Knockout here than anywhere else. The Dunkin’ Dutchmen spent a summer competing at Burton Park. Tough competition all around. As a kid, I spent some memorable days hanging out with my cousin Brian in his basement. The court may have been small, but it was concrete, which allowed for dribbling, and the hoop was low enough to dunk on using a mini-ball. It wasn’t a nerf/children’s hoop either. I still remember stoving my finger on the solid metal rim on a failed dunk attempt. Growing up, my brother Mike and I would organize our extensive sports card collections into teams. Individually we would then ceate entire seasons using our imaginations. The hours spent playing basketball against myself, staging dunk and 3-point contests, are among my favorite childhood memories. Accepting my camp all-star award from my coach at the Charlie Ward camp. Over the years, I’ve had many different playing experiences at Family First. Two stand out from the rest. First was teaming with Matt Wachter and Bob Barber as the “Flying Toasters” and winning the 3-on-3 tournament. 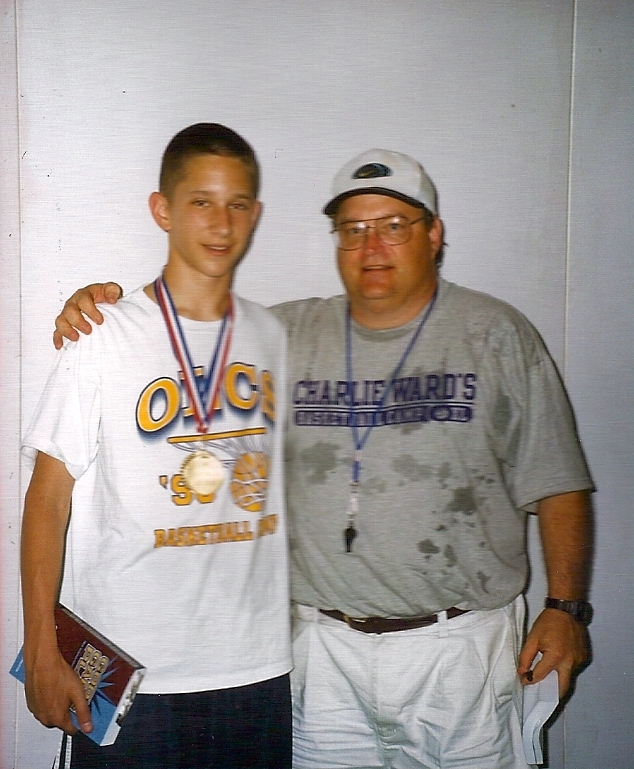 The second was the Charlie Ward basketball camp I participated in. Because we were three years apart in school, my brother Mike and I had limited opportunities to play basketball together in any formal context growing up. 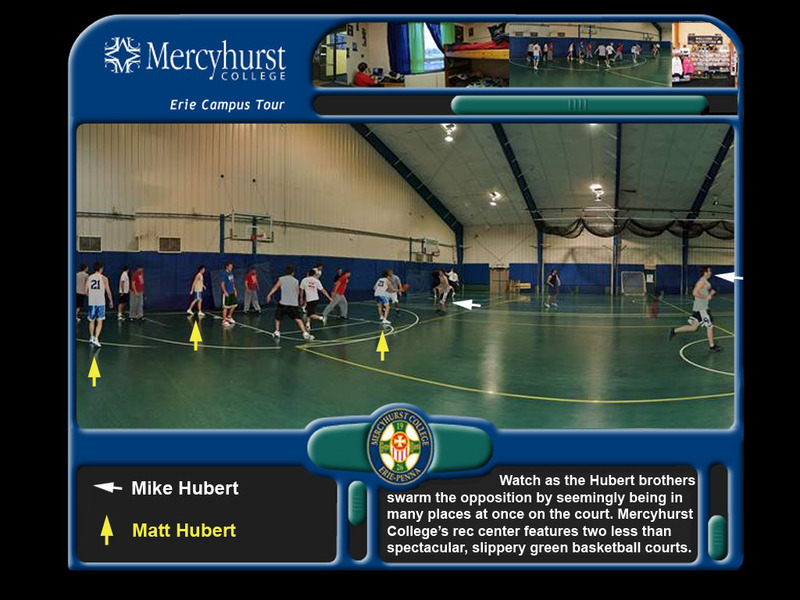 That was part of what made intramurals at Mercyhurst so fun. The other part was our championship run for the ages. We snuck into the playoffs as the 8th and final seed. Our first round opponent featured a former D1 player from Penn State who had matched up against Greg Oden when he was at Ohio State. We won. Hours later we pulled a second upset and earned a spot in the championship. That game was one of the most competitive games I ever played in. Both teams were in a zone and the intensity felt like a high school playoff game except with zero crowd noise. It was unlike anything I’ve ever experienced before or since. It was such a well-played game that it felt like anything but intramurals. Eventually, we prevailed. Mike and I still bring up this championship run any time an underdog team makes a run in the tournament. 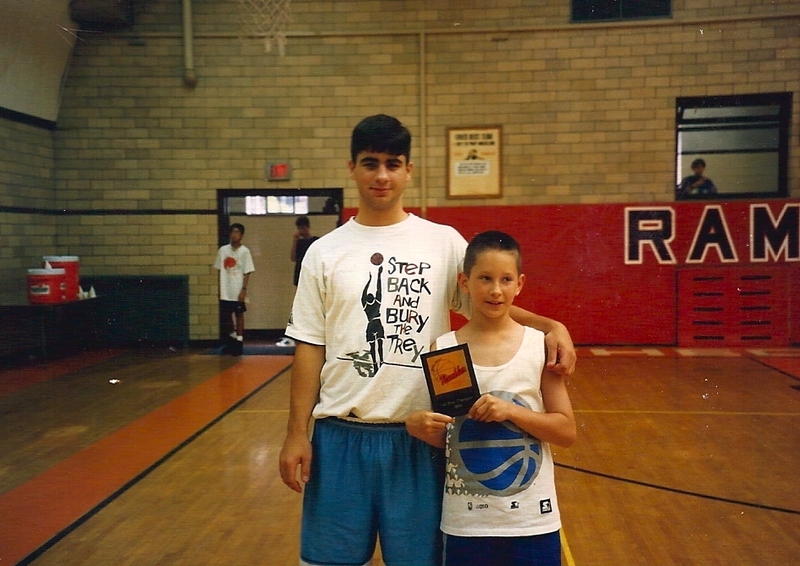 At the Rambler Roundball Camp in 1995 with cousin Keith. In addition to being the home court during my freshman and sophomore seasons, the Prep gym was also the home to the aforementioned Rambler Roundball Camp that I attended summer after summer as a youngster. More recently, I returned to the Prep gymnasium for the Faculty vs. CYO All-Stars showdown. Our faculty squad won the game in 2013 but came up a bit short this past season. I was playing at OLC pre-renovation when the court was made of the slipperiest tile known to man. Whether it was Sr. Ann Louis’ legendary intramurals (“Aim for the orange square!”), gym class, or playing for the school team, I had a lot of great times at OLC. Earning the team MVP award in 8th grade was arguably the zenith of my playing career. 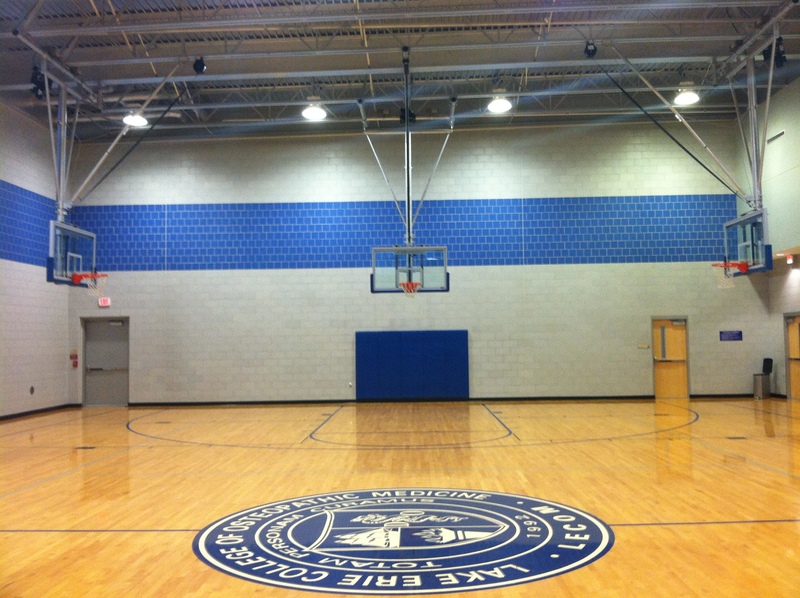 I also called OLC’s gym home in 11th and 12th grade as a member of St. Jude’s CYO team. Being cut from the varsity team at Prep stung a lot, but helping the Judes earn a trip to the state tournament as a junior helped ease the pain. 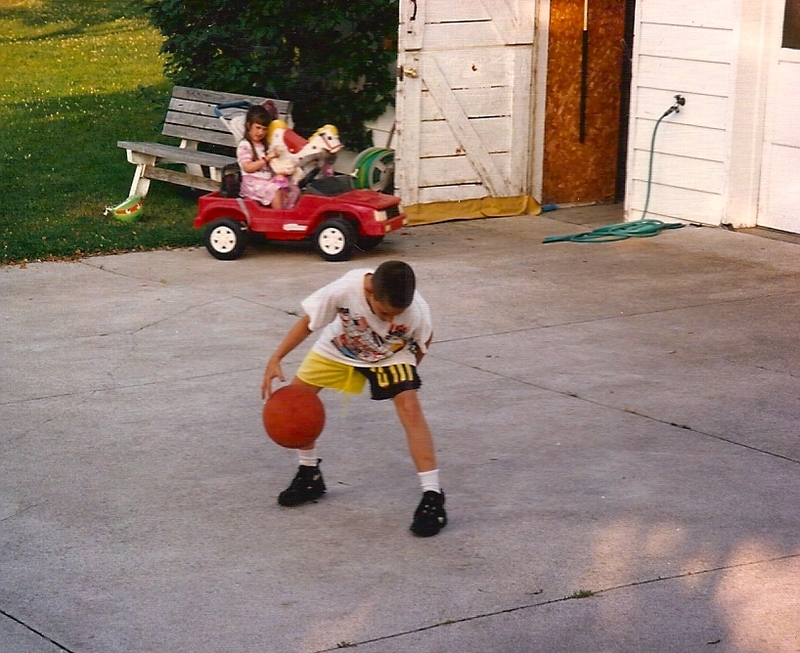 Perfecting the art of the crossover dribble as a youngster. There is no court where I feel as comfortable as I do on this court at my parents’ house in Fairview. My parents bought the house before I was born and have lived there ever since. The story goes that one of the first things my dad did after they moved was to put the hoop up on top of the garage—all the more impressive because he was not a huge sports fanatic the way I am. There’s no court like home. 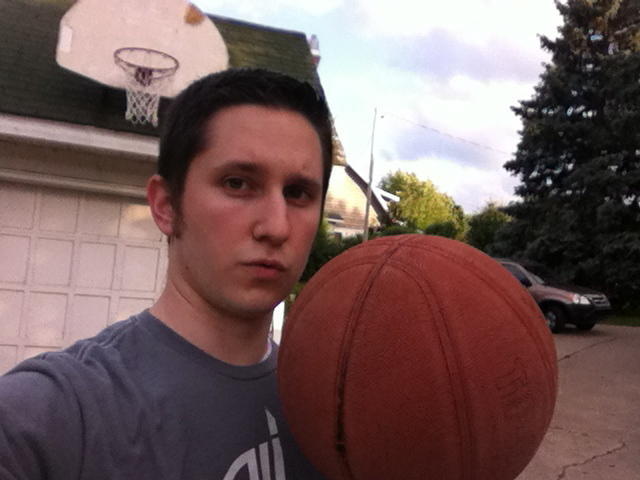 Whether it was one-on-one games with Mike, two-on-two with Ryan Colvin and I going against Mike and Mark Demski (during which Demski gave me my streetball nickname, Half Court Hero), or epic family games of around the world, knockout, H-O-R-S-E or P-I-G, I know this court like no other. There’s a dropoff in one corner. The other corner slopes upward. For me, the straight-on 3-pointer might as well be a layup. 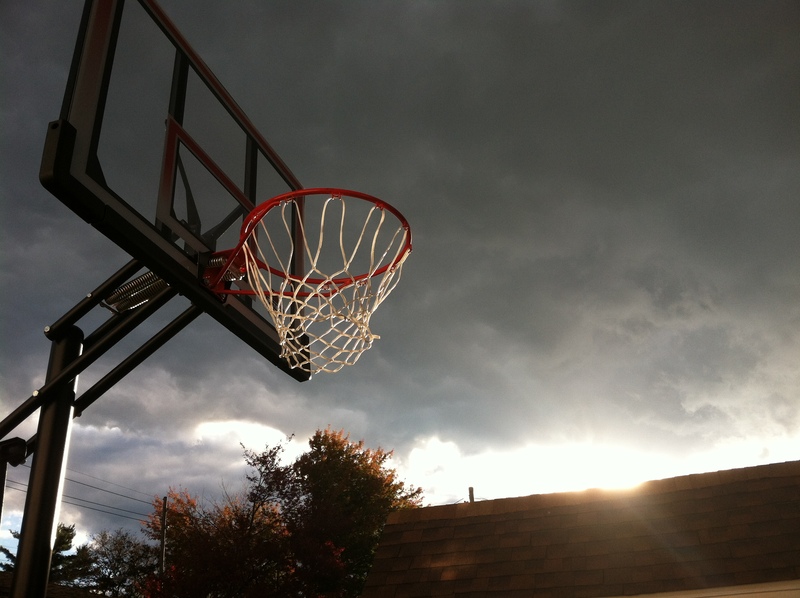 Every dream that I was unable to live out in real life was at some point played out in my mind on this court. The number of game-winning buzzer beaters I hit here would surely give MJ, Kobe, Reggie, and Bob Horry something to be jealous of. And for that, my parents’ driveway court, my original home court, earns the number one spot on this countdown.